to celebrate the offices of Sherriff and Lord Mayor. Members of the Company are encouraged to take part by attending the event and also helping to fundraise for Whitechapel Mission. See below details of the event and timings. people and watched live on the BBC by millions more. It’s FREE to attend and view - from Mansion House to Fleet Street via Cheapside and St Paul’s then back via Embankment. What Happens at the Show? Over 500,000 people come to see the Lord Mayor’s Show, which takes places each year on the second Saturday in November. Around 140 floats plus 7,000 performers form a 3-mile Procession, and start at the Lord Mayor’s residence, the Mansion House, at 11am after a two minute silence ahead of Remembrance Sunday. The Show fills the whole area between Mansion House and the Royal Courts of Justice in Aldwych. It travels out via St Paul’s between 11am and 12.30pm, and returns by the embankment between 1pm and 2.30pm. Towards the head of the procession you will see two stern but benevolent wicker giants. They are Gog and Magog, the traditional guardians of the City of London, and they have been carried in the Lord Mayor’s Show since the reign of Henry V in 1416 AD. Behind them is a single parade that will take over an hour to pass by. The Gold State Coach leaves Guildhall 45 minutes later, travelling to Mansion House to pick up the new Lord Mayor. It joins the procession near the back - over an hour behind the first float - and travels with it to St Paul’s, where the Lord Mayor pauses to receive a blessing. After a few minutes the coach and the remaining procession continue down Ludgate Hill and Fleet Street to the Royal Courts of Justice. 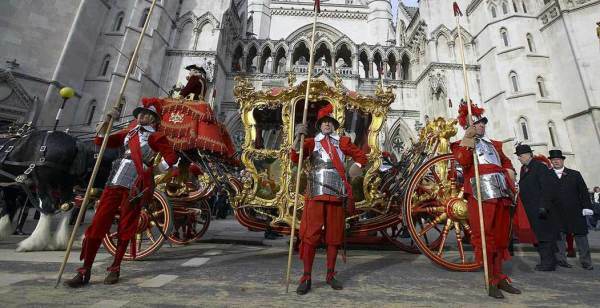 While the new Lord Mayor makes his or her oath of loyalty to the Crown, the Pageantmaster’s team arranges the procession into the side streets around Aldwych, and feeding and watering thousands of people and hundreds of horses. They reform on Victoria Embankment, and the procession sets off at 1pm. The state coach returns the Lord Mayor to Mansion House between 2pm and 2.30pm. After the procession you will find London’s City Guides on hand to lead free guided tours of the City’s more strange and wonderful corners. Further details of each year’s Show are released upon the election of the new Lord Mayor, which happens at the beginning of October. There is a massive range of floats, bands, costumes, constructions, military units taking part. There are always surprises every year. We can tell you that it is the longest, grandest, most meticulously organised procession in the world. There is no way to rehearse a three mile procession in the middle of the City of London, so it’s all put together on the day and if you want to find out how well those three miles fit into a 1.7 mile route, you’ll have to come along and see! The Whitechapel Mission has been serving the homeless and marginalised for 141 years – including a day centre, skills training and career advice, activity programmes and specialist support for complex needs. By encouraging each person to address the issues which caused their homelessness, we help them to gain the skills and confidence to make lasting changes in their lives. Go to https://whitechapel.org.uk/ for more details. For more information on how to attend/help sponsor the event click above.